This was originally going to be one of those quick and dirty reviews. Two Argentinean wines, a snack provided by Chef Tim (that would be Tim Ellison, one of our favourite local sommeliers and co-founder of the BC Wine Appreciation Society), followed by a fast dash through the Cambie Liquor store to stock up on a few winter staples like Cognac and Champagne. Oh well, things change. Uncharacteristically for a Saturday, there was plenty of parking – must be something to do with the snow. Vancouver + Snow = Mass Panic. Tim and I do our usual three-kiss-on-the-cheek greeting – that’s right cheek to right cheek, left to left, and right to right in case you’ve ever wondered. The beef he’s carving with Melissa Popp from Hills Foods smells wonderful and the Chimichurri Sauce looks even better. 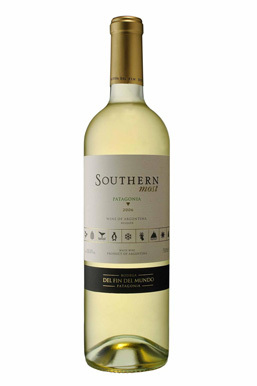 Both wines on offer are from Bodega del Fin del Mundo from Patagonia, Argentinean – Southern most White and Southern most Red. Hmmm. White and Red. That tells me a lot, but what the heck. Turns out our white is a 60/40 Sauvignon Blanc, Chardonnay blend. Surprisingly crisp with a pleasing length to the finish – not huge but pleasing. Today, however, this wine seemed just a bit too citrus without food – or maybe I’m just cantankerous from the snow. Still, at the price point of $12.95, this is one worth stocking for when you need a sipper with light nibblies. I’m already thinking summer sailing and it’s only December. The red is 70/15/15 Merlot, Malbec, and Cabernet Sauvignon. Once again priced at $12.95, this is one good value. A hint of tobacco and a nice, round mouth feel. I was surprised I liked it as much as I did. And it went fabulously well with the beef – although I had to check that particular pairing twice just to be sure. 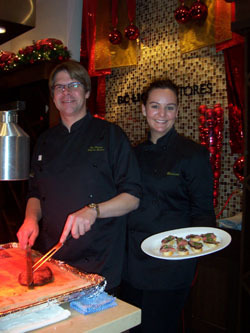 Tim and Melissa Popp from Hills Foods were happy to provide a photo op for the results of their combined cooking talents. Arriving home, I thought it would be fun to find out more about a winery located – literally – at the end of the world. One thing lead to another – like good surfing usually does. I spent, let’s just say “a while,” including a browse about through the Hills Foods site (who generously provided today’s beef) – some great recipes and cool organic meat products. But here’s the summary about the wines. Bodega del Fin del Mundo was founded in 1999 when the owners planted vines on a deserted plot of land in Patagonia, Argentina. First problem – no water. From the pictures on the website, there’s not only no water, there isn’t much of anything here – think bleak, windswept, and desolated. Twenty kilometers of irrigation canal with computerized pumping system later, there was water, but now each plant needed its own windbreak to protect it from the gales that swept across the land on a seemingly daily basis. These folks clearly have plenty of the stubborn gene. In 2002, their first vinification produced 30,000 bottles and netted a silver medal for Malbec. The owners began constructing a new, contemporary winery so they could move out of the small warehouse they’d been using to date. By 2004 were winning gold and silver medals at the Brussels Wine Expo and the Mondial du Pinot Noir in Switzerland, and their list of medals gets longer every year. Also interesting, Bodega del Fin del Mundo continues to consider itself an experimental vineyard and is researching the viability of grape varieties seldom associated with Argentina – Petit Verdot, Cabernet Franc, Aspirant Boushet, and Viognier. And here’s a bonus, Tim even shared his recipe for his Chimichurri Sauce. Check it out. Thanks Tim! A light oil and vinegar sauce with chopped parsley, cilantro, and garlic. Use as a garnish on your favourite cut of grilled beef. Makes 1 cup and would be wicked with fish and chicken too. Whisk together oil and vinegar in non-reactive bowl. Cover and refrigerate for 2-3 hours to allow flavours to develop. Serve as a garnish with all types of grilled meats and fish. Will keep covered in the fridge for 2-3 days. This entry was posted in Argentina wines, chimichurri and tagged Argentina, Cabernet Franc, Cabernet Sauvignon, Malbec, Petit Verdot, Pinot Noir, Sauvignon blanc, Wine. Bookmark the permalink.